Necrotizing enterocolitis (NEC), which typically occurs in the second to third week of life in premature, formula-fed infants, is characterized by variable damage to the intestinal tract, ranging from mucosal injury to full-thickness necrosis and perforation (see the image below). NEC affects close to 10% of infants who weigh less than 1500 g, with mortality rates of 50% or more depending on severity, but may also occur in term and near-term babies. Normal (top) versus necrotic section of bowel. Photo courtesy of the Department of Pathology, Cornell University Medical College. In premature infants, onset of NEC is typically during the first several weeks after birth, with the age of onset inversely related to gestational age at birth. In term infants, the reported median age of onset is 1-3 days, but onset may occur as late as age 1 month. NEC most commonly affects the terminal ileum and the proximal ascending colon. However, varying degrees of NEC can affect any segment of the small intestine or colon. The entire bowel may be involved and may be irreversibly damaged. Although the exact etiology of necrotizing enterocolitis (NEC) remains unknown, research suggests that it is multifactorial; ischemia and/or reperfusion injury, exacerbated by activation of proinflammatory intracellular cascades, may play a significant role. Cases that cluster in epidemics suggest an infectious etiology. Gram-positive and gram-negative bacteria, fungi, and viruses have all been isolated from affected infants; however, many infants have negative culture findings. Furthermore, the same organisms isolated in stool cultures from affected babies have also been isolated from healthy babies. Extensive experimental work in animal models suggests that translocation of intestinal flora across an intestinal mucosal barrier rendered vulnerable by the interplay of intestinal ischemia, immunologic immaturity, and immunological dysfunction may play a role in the etiology of the disease, spreading it and triggering systemic involvement. Such a mechanism could account for the apparent protection breast-fed infants have against fulminant NEC. Animal model research studies have shed light on the pathogenesis of this disease. Regardless of the triggering mechanisms, the resultant outcome is significant inflammation of the intestinal tissues, the release of inflammatory mediators (eg, leukotrienes, tumor necrosis factor [TNF], platelet-activating factor [PAF]) and intraluminal bile acids, and downregulation of cellular growth factors, all of which lead to variable degrees of intestinal damage. In healthy individuals, the intestinal milieu is characterized by a predominance of bifidobacteria. Such colonization is enhanced by the presence of oligofructose, a component of human milk, in the intestinal lumen. Infants who receive formula feedings without oligofructose as a constituent have been noted to have a predominance of clostridial organisms. Although infectious organisms have long been thought to play a key role in the development of NEC, specifics regarding this role continue to be elusive. Whether bacterial infection has a primary inciting role in NEC or whether an initial intestinal mucosal injury allows secondary bacterial invasion is unclear. Is it a straight-forward "infection" with a pathogenic organism that starts the disease cascade, or is it more complex? Positive blood cultures are found in 30% of patients; the most commonly identified organisms are Escherichia coli and Klebsiella pneumoniae. Proteus mirabilis, Staphylococcus aureus, S epidermidis, Enterococcus species, Clostridium perfringens, and Pseudomonas aeruginosa have also been identified. E coli, Klebsiella species, Enterobacter cloacae, P aeruginosa, Salmonella species, S epidermidis, C perfringens, C difficile, and C butyricum commonly grow in stool cultures. Klebsiella species, E coli, S epidermidis, and yeast are most commonly identified on peritoneal cultures. Fungal infection is believed to be an opportunistic infection in the presence of an altered host intestinal defense system. New opportunistic and pathologic bacteria are being identified and speciated, especially as the protective role of probiotics continues to be elucidated. Infant formulas contaminated with organisms such as Cronobacter species (previously called Enterobacter sakazakii)  further complicate the picture as to whether the formula or the bacteria are implicated in the disease or, conversely, whether the breast milk or the bacteria are protective. The observation of an epidemic or cluster of cases in a short period in one nursery after sporadic cases supports the key role of infectious organisms in NEC. Nursery personnel are known to experience acute gastrointestinal (GI) illnesses in association with these outbreaks, and the institution of infection control measures has accordingly reduced the rates of NEC. Rat pups colonized with Staphylococcus aureus and Escherichia coli demonstrated increased incidence and severity of necrotizing enterocolitis compared with those whose intestines were populated with various bacterial species. Toll-like receptor signaling of intestinal mucosal transmembrane proteins is accomplished by binding of specific bacterial ligands that mediate the inflammatory response; the character of the intestinal bacterial milieu is thought to play a role in the up-regulation or down-regulation of intestinal inflammation via toll-receptor signaling. Epidemiologically, some have noted that infants exposed to intrauterine environments marked by compromised placental blood flow (ie, maternal hypertension, preeclampsia, cocaine exposure) have an increased incidence of NEC. Similarly, infants with postnatally diminished systemic blood flow, as is found in patients with patent ductus arteriosus or congenital heart disease (both considered risk factors for NEC), also have an increased incidence. Infants with patent ductus arteriosus are at particularly high risk for developing NEC if pharmacologic closure is attempted. Alterations in hepatobiliary cell junction integrity result in leakage of these proinflammatory substances and bile acids into the intestinal lumen, increasing intestinal injury. Cellular protective mechanisms such as epidermal growth factor (EGF), transforming growth factor β1 (TGF-β1), and erythropoietin are down-regulated, further compromising the infant's ability to mount a protective response. Subsequent norepinephrine release and vasoconstriction result in splanchnic ischemia, followed by reperfusion injury. Intestinal necrosis results in breach of the mucosal barrier, allowing for bacterial translocation and migration of bacterial endotoxin into the damaged tissue. The endotoxin then interacts synergistically with PAF and a multitude of other proinflammatory molecules to amplify the inflammatory response. Activated leukocytes and intestinal epithelial xanthine oxidase may then produce reactive oxygen species, leading to further tissue injury and cell death. Experimental administration of PAF inhibitors in animal models has not been shown to mitigate intestinal mucosal injury. Many other modulators of the inflammatory response are being studied both in vivo in animal models and in vitro in an attempt to mitigate or prevent the morbidity and mortality caused by fulminant necrotizing enterocolitis. NEC is principally a disease of premature infants. Although approximately 5-25% of infants with NEC are born full term, studies have found a markedly decreased risk of NEC with increasing gestational age. This finding suggests that maturation of the GI system plays an important role in the development of NEC. The premature neonate has numerous physical and immunologic impairments that compromise intestinal integrity. Gastric acid and pepsin production are decreased during the first month of life. Pancreatic exocrine insufficiency is associated with low levels of enterokinase, the enzyme that converts trypsinogen to trypsin, which allows hydrolysis of intestinal toxins. Mucus secretion from immature goblet cells is decreased. Gut motility is impaired, and peristaltic activity is poorly coordinated. Finally, secretory immunoglobulin A (IgA) is deficient in the intestinal tract of premature infants not fed breast milk. In the preterm infant, mucosal cellular immaturity and the absence of mature antioxidative mechanisms may render the mucosal barrier more susceptible to injury. Intestinal regulatory T-cell aggregates are a first-line defense against luminal pathogens and may be induced by collections of small lymphoid aggregates, which are absent or deficient in the premature infant. Experimental and epidemiologic studies have noted that feeding with human milk has a protective effect; however, donor human milk that has been pasteurized is not as protective. Human milk contains secretory immunoglobulin A (IgA), which binds to the intestinal luminal cells and prohibits bacterial transmural translocation. Other constituents of human milk, such as IL-10, EGF, TGF-β1, and erythropoietin, may also play a major role in mediating the inflammatory response. Oligofructose encourages replication of bifidobacteria and inhibits colonization with lactose-fermenting organisms. Human milk has been found to contain PAF acetylhydrolase, which metabolizes PAF; preterm human milk has higher PAF acetylhydrolase activity (as much as 5 times greater in one study  ) than milk collected from women who delivered at term. Twin studies have suggested susceptibility to NEC may be affected by a genetic component. Given the frequent subtle and nonspecific nature of presenting symptoms, identification of a biomarker for infants at higher risk of developing necrotizing enterocolitis could have significant impact on morbidity and mortality rates. Although some studies indicate a higher frequency of NEC in black babies than in white babies, other studies show no difference based on race. Most studies indicate that male and female babies are equally affected. The frequency of necrotizing enterocolitis (NEC) varies among nurseries, without correlation with season or geographic location. Outbreaks of NEC seem to follow an epidemic pattern within nurseries, suggesting an infectious etiology, although a specific causative organism has not been isolated. NEC is more prevalent in premature infants, with incidence inversely related to birth weight and gestational age. Although specific numbers range from 4% to more than 50%, infants who weigh less than 1000 g at birth have the highest attack rates. This rate dramatically drops to 3.8 per 1000 live births for infants who weigh 1501-2500 g at birth. Similarly, rates profoundly decrease for infants born after 35-36 weeks' postconceptional age. The average age of onset in premature infants seems to be related to postconceptional age, with babies born earlier developing NEC at a later chronologic age. The average age of onset has been reported to be 20.2 days for babies born at less than 30 weeks' estimated gestational age (EGA), 13.8 days for babies born at 31-33 weeks' EGA, and 5.4 days for babies born after 34 weeks' gestation. Term infants develop necrotizing enterocolitis much earlier, with the average age of onset within the first week of life or, sometimes, within the first 1-2 days of life. Observational studies have suggested the etiology of the disease in term and near-term infants may be different than that postulated in the premature infant and could include entities such as cow's milk protein–induced enterocolitis and glucose-6-phosphate dehydrogenase deficiency. With improved supportive intensive care, including ventilatory management, anesthetic techniques, and total parenteral nutrition, the survival of infants with necrotizing enterocolitis (NEC) has steadily improved since the late 20th century. The improved prognosis is most notable in critically ill neonates younger than 28 weeks' gestational age who weigh less than 1000 g. However, these neonates are still at significantly increased risk for pan involvement and are more likely than other premature infants to require surgery. The improvement in treatment efficacy in infants with NEC is underscored by the fact that if patients with pan involvement are excluded, the survival in surgically treated infants with NEC is 95%. However, comparison between reported series is difficult because of wide variations in patient populations, extent of disease, coexisting conditions, and severity categorization between centers. Of those patients who survive, 50% develop a long-term complication. The 2 most common complications are intestinal stricture and short-gut syndrome. This complication, the incidence of which is 25-33%, can develop in infants with or without a preceding perforation. Intestinal stricture occurs when an area of intestinal ischemia heals with resultant fibrosis and scar formation that impinges on the diameter of the lumen. The most common site of stricture is the left colon, followed by the terminal ileum. Intestinal stricture is most common in infants treated nonoperatively, because infants treated operatively commonly undergo contrast enema before closure of the ostomy, and any area of stricture is resected when the ostomy is closed. Intestinal stricture should be suspected in any infant who receives nonoperative treatment for NEC and who fails to thrive and/or has bloody stools or bowel obstruction. Symptoms of feeding intolerance and bowel obstruction typically occur 2-3 weeks after recovery from the initial event. Short-gut syndrome is the most serious postoperative complication in NEC, occurring in as many as 23% of patients after intestinal resection. This is a malabsorption syndrome resulting from the removal of excessive or critical portions of small bowel necessary for absorption of essential nutrients from the intestinal lumen. Symptoms are most profound in babies who either have lost most of their small bowel or have lost a smaller portion that includes the ileocecal valve. Loss of small bowel can result in malabsorption of nutrients, as well as of fluids and electrolytes. The neonatal gut grows and adapts over time, but long-term studies suggest that this growth may take as long as 2 years to occur. During that time, maintenance of an anabolic and complete nutritional state is essential for the growth and development of the baby. This is achieved by parenteral provision of adequate vitamins, minerals, and calories; appropriate management of gastric acid hypersecretion; and monitoring for bacterial overgrowth. The addition of appropriate enteral feedings during this time is important for gut nourishment and remodeling. Babies who can never successfully feed enterally and/or who develop life-threatening hyperalimentation liver disease may be candidates for organ transplantation. Centers specializing in neonatal and infant small bowel and liver transplantation may consider referrals on a case-by-case basis. Cholestatic liver disease is a multifactorial condition caused by prolonged fasting and total parenteral nutrition. 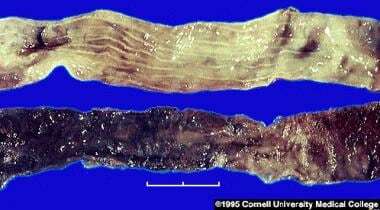 It is characterized by hepatomegaly and elevated aminotransferase and direct bilirubin levels. The treatment is initiation of enteral feedings as early as possible to stimulate bile flow. Recurrent NEC is an uncommon complication that can occur after either operative or nonoperative management of NEC. It is seen in only 4-6% of patients with NEC. Recurrent NEC has not been associated with the method of managing the initial episode, the timing of enteral feedings, or the site of initial disease. Infants who survive NEC are at increased risk for neurodevelopmental disorders. As many as 50% of infants who survive NEC have some abnormality in intelligence and motor skills. However, the incidence of non-gastrointestinal sequelae in matched cohorts with and without NEC are similar, implying that neurodevelopmental problems may be a function of underlying prematurity rather than of NEC itself. A multicenter, retrospective study in Switzerland reported a 29% rate of catheter-related sepsis in patients with Bell stage II kept on a diet of nothing by mouth (NPO) for longer than 5 days. Prolonged hyperalimentation and the absence of enteral nutrition can cause cholestasis, direct hyperbilirubinemia, and other metabolic complications. Scmid O, Quaiser K. Uer eine besondere schwere verlaufende Form von enteritis beim saugling. Oesterr Z Kinderh. 1953. 8:114. Berdon WE. Necrotizing enterocolitis in the premature infant. Radiology. 1964. 83:879. Rusconi B, Good M, Warner BB. The microbiome and biomarkers for necrotizing enterocolitis: are we any closer to prediction?. J Pediatr. 2017 Oct. 189:40-7.e2. [Medline]. Patel RM, Underwood MA. Probiotics and necrotizing enterocolitis. Semin Pediatr Surg. 2018 Feb. 27 (1):39-46. [Medline]. Roze JC, Ancel PY, Lepage P, et al, for the Nutrition EPIPAGE 2 study group and the EPIFLORE Study Group. Nutritional strategies and gut microbiota composition as risk factors for necrotizing enterocolitis in very-preterm infants. Am J Clin Nutr. 2017 Sep. 106 (3):821-30. [Medline]. Patel AL, Kim JH. Human milk and necrotizing enterocolitis. Semin Pediatr Surg. 2018 Feb. 27 (1):34-8. [Medline]. Hunter CJ, Bean JF. Cronobacter: an emerging opportunistic pathogen associated with neonatal meningitis, sepsis and necrotizing enterocolitis. J Perinatol. 2013 Aug. 33(8):581-5. [Medline]. Hunter, CJ, Camerini V, Boyle A, et al. Bacterial Flora Enhance Intestinal Injury and Inflammation in the Rat Pup Model of Necrotizing Enterocolitis. Presented at PAS 2007, Toronto: Childrens hospital Los Angeles, CA; 2007. Blackwood BP, Yuan CY, Wood DR, Nicolas JD, Grothaus JS, Hunter CJ. Probiotic Lactobacillus species strengthen intestinal barrier function and tight junction integrity in experimental necrotizing enterocolitis. J Probiotics Health. 2017 Apr. 5 (1):[Medline]. [Full Text]. Pickard SS, Feinstein JA, Popat RA, Huang L, Dutta S. Short- and long-term outcomes of necrotizing enterocolitis in infants with congenital heart disease. Pediatrics. 2009 May. 123(5):e901-6. [Medline]. [Full Text]. Been JV, Lievense S, Zimmermann LJ, Kramer BW, Wolfs TG. Chorioamnionitis as a risk factor for necrotizing enterocolitis: a systematic review and meta-analysis. J Pediatr. 2013 Feb. 162(2):236-42.e2. [Medline]. Moya FR, Eguchi H, Zhao B, et al. Platelet-activating factor acetylhydrolase in term and preterm human milk: a preliminary report. J Pediatr Gastroenterol Nutr. 1994 Aug. 19(2):236-9. [Medline]. Book LS, Herbst JJ, Atherton SO, Jung AL. Necrotizing enterocolitis in low-birth-weight infants fed an elemental formula. J Pediatr. 1975 Oct. 87(4):602-5. [Medline]. Wan-Huen P, Bateman D, Shapiro DM, Parravicini E. Packed red blood cell transfusion is an independent risk factor for necrotizing enterocolitis in premature infants. J Perinatol. 2013 Oct. 33(10):786-90. [Medline]. Maheshwari A, Patel RM, Christensen RD. Anemia, red blood cell transfusions, and necrotizing enterocolitis. Semin Pediatr Surg. 2018 Feb. 27 (1):47-51. [Medline]. Bhandari V, Bizzarro MJ, Shetty A, Zhong X, Page GP, Zhang H, et al. Familial and genetic susceptibility to major neonatal morbidities in preterm twins. Pediatrics. 2006 Jun. 117(6):1901-6. [Medline]. Moonen RM, Paulussen AD, Souren NY, Kessels AG, Rubio-Gozalbo ME, Villamor E. Carbamoyl phosphate synthetase polymorphisms as a risk factor for necrotizing enterocolitis. Pediatr Res. 2007 Aug. 62(2):188-90. [Medline]. Franklin AL, Said M, Cappiello CD, et al. Are immune modulating single nucleotide polymorphisms associated with necrotizing enterocolitis?. Sci Rep. 2015 Dec 16. 5:18369. [Medline]. Treszl A, Heninger E, Kalman A, Schuler A, Tulassay T, Vasarhelyi B. Lower prevalence of IL-4 receptor alpha-chain gene G variant in very-low-birth-weight infants with necrotizing enterocolitis. J Pediatr Surg. 2003 Sep. 38(9):1374-8. [Medline]. Young C, Sharma R, Handfield M, Mai V, Neu J. Biomarkers for Infants at Risk for Necrotizing Enterocolitis: Clues to Prevention?. Pediatr Res. 2009 Jan 28. [Medline]. More K, Athalye-Jape G, Rao S, Patole S. Association of inhibitors of gastric acid secretion and higher incidence of necrotizing enterocolitis in preterm very low-birth-weight infants. Am J Perinatol. 2013 Nov. 30(10):849-56. [Medline]. Terrin G, Passariello A, De Curtis M, et al. Ranitidine is Associated With Infections, Necrotizing Enterocolitis, and Fatal Outcome in Newborns. Pediatrics. 2012 Jan. 129(1):e40-5. [Medline]. Shalabi M, Mohamed A, Lemyre B, Aziz K, Faucher D, Shah PS, et al. Antenatal exposure to magnesium sulfate and spontaneous intestinal perforation and necrotizing enterocolitis in extremely preterm neonates. Am J Perinatol. 2017 Oct. 34 (12):1227-33. [Medline]. Kawase Y, Ishii T, Arai H, Uga N. Gastrointestinal perforation in very low-birthweight infants. Pediatr Int. 2006 Dec. 48(6):599-603. [Medline]. Kovacs L, Papageorgiou, A. Incidence, Predisposing Factors and Outcome of NEC in Infants <32 Weeks' Gestation. Presented at PAS 2007, Toronto: SMBD-Jewish General Hospital, McGill University, Montreal; 2007. Wiswell TE, Robertson CF, Jones TA, Tuttle DJ. Necrotizing enterocolitis in full-term infants. A case-control study. Am J Dis Child. 1988 May. 142(5):532-5. [Medline]. Robinson JR, Kennedy C, van Arendonk KJ, Green A, Martin CR, Blakely ML. Neurodevelopmental considerations in surgical necrotizing enterocolitis. Semin Pediatr Surg. 2018 Feb. 27 (1):52-6. [Medline]. Brotschi B, Baenziger O, Frey B, Bucher HU, Ersch J. Early enteral feeding in conservatively managed stage II necrotizing enterocolitis is associated with a reduced risk of catheter-related sepsis. J Perinat Med. 2009 Aug 13. [Medline]. McKeown RE, Marsh TD, Amarnath U, et al. Role of delayed feeding and of feeding increments in necrotizing enterocolitis. J Pediatr. 1992 Nov. 121(5 Pt 1):764-70. [Medline]. Shorter NA, Liu JY, Mooney DP, Harmon BJ. Indomethacin-associated bowel perforations: a study of possible risk factors. J Pediatr Surg. 1999 Mar. 34(3):442-4. [Medline]. Adderson EE, Pappin A, Pavia AT. Spontaneous intestinal perforation in premature infants: a distinct clinical entity associated with systemic candidiasis. J Pediatr Surg. 1998 Oct. 33(10):1463-7. [Medline]. Stark AR, Carlo WA, Tyson JE, et al. Adverse effects of early dexamethasone in extremely-low-birth-weight infants. National Institute of Child Health and Human Development Neonatal Research Network. N Engl J Med. 2001 Jan 11. 344(2):95-101. [Medline]. Sylvester KG, Ling XB, Liu GY, Kastenberg ZJ, Ji J, Hu Z, et al. Urine protein biomarkers for the diagnosis and prognosis of necrotizing enterocolitis in infants. J Pediatr. 2014 Mar. 164(3):607-612.e7. [Medline]. Bohnhorst B. Usefulness of abdominal ultrasound in diagnosing necrotising enterocolitis. Arch Dis Child Fetal Neonatal Ed. 2013 Sep. 98(5):F445-50. [Medline]. Deeg KH, Rupprecht T, Schmid E. Doppler sonographic detection of increased flow velocities in the celiac trunk and superior mesenteric artery in infants with necrotizing enterocolitis. Pediatr Radiol. 1993. 23(8):578-82. [Medline]. Harding A. Slow feeding helps prevent necrotizing enterocolitis in smallest preemies. Reuters Health. October 27, 2014. Available at http://www.pediatricsconsultant360.com/story/slow-feeding-helps-prevent-necrotizing-enterocolitis-smallest-preemies. Accessed: November 1, 2014. Viswanathan S, McNelis K, Super D, Einstadter D, Groh-Wargo S, Collin M. A Standardized Slow Enteral Feeding Protocol and the Incidence of Necrotizing Enterocolitis in Extremely Low Birth Weight Infants. JPEN J Parenter Enteral Nutr. 2014 Oct 14. [Medline]. Kapoor V, Glover R, Malviya MN. Alternative lipid emulsions versus pure soy oil based lipid emulsions for parenterally fed preterm infants. Cochrane Database Syst Rev. 2015 Dec 2. 12:CD009172. [Medline]. Hoyos AB. Reduced incidence of necrotizing enterocolitis associated with enteral administration of Lactobacillus acidophilus and Bifidobacterium infantis to neonates in an intensive care unit. Int J Infect Dis. 1999. 3(4):197-202. [Medline]. Alfaleh K, Anabrees J, Bassler D. Probiotics Reduce the Risk of Necrotizing Enterocolitis in Preterm Infants: A Meta-Analysis. Neonatology. 2009 Aug 25. 97(2):93-99. [Medline]. Olsen R, Greisen G, Schrøder M, Brok J. Prophylactic probiotics for preterm infants: a systematic review and meta-analysis of observational studies. Neonatology. 2015 Dec 2. 109 (2):105-112. [Medline]. Sharma D, Shastri S. Lactoferrin and neonatology - role in neonatal sepsis and necrotizing enterocolitis: present, past and future. J Matern Fetal Neonatal Med. 2016 Mar. 29 (5):763-70. [Medline]. Pammi M, Abrams SA. Oral lactoferrin for the prevention of sepsis and necrotizing enterocolitis in preterm infants. Cochrane Database Syst Rev. 2011 Oct 5. CD007137. [Medline]. Drucker NA, McCulloh CJ, Li B, Pierro A, Besner GE, Markel TA. Stem cell therapy in necrotizing enterocolitis: current state and future directions. Semin Pediatr Surg. 2018 Feb. 27 (1):57-64. [Medline]. McCulloh CJ, Olson JK, Wang Y, Vu J, Gartner S, Besner GE. Evaluating the efficacy of different types of stem cells in preserving gut barrier function in necrotizing enterocolitis. J Surg Res. 2017 Jun 15. 214:278-85. [Medline]. McCulloh CJ, Olson JK, Zhou Y, Wang Y, Besner GE. Stem cells and necrotizing enterocolitis: a direct comparison of the efficacy of multiple types of stem cells. J Pediatr Surg. 2017 Jun. 52 (6):999-1005. [Medline]. Vaughan WG, Grosfeld JL, West K, Scherer LR 3rd, Villamizar E, Rescorla FJ. Avoidance of stomas and delayed anastomosis for bowel necrosis: the 'clip and drop-back' technique. J Pediatr Surg. 1996 Apr. 31(4):542-5. [Medline]. Martin LW, Neblett WW. Early operation with intestinal diversion for necrotizing enterocolitis. J Pediatr Surg. 1981 Jun. 16(3):252-5. [Medline]. Ein SH, Marshall DG, Girvan D. Peritoneal drainage under local anesthesia for perforations from necrotizing enterocolitis. J Pediatr Surg. 1977 Dec. 12(6):963-7. [Medline]. Moss RL, Dimmitt RA, Barnhart DC, Sylvester KG, Brown RL, Powell DM, et al. Laparotomy versus peritoneal drainage for necrotizing enterocolitis and perforation. N Engl J Med. 2006 May 25. 354(21):2225-34. [Medline]. Premkumar MH, Carter BA, Hawthorne KM, King K, Abrams SA. High rates of resolution of cholestasis in parenteral nutrition-associated liver disease with fish oil-based lipid emulsion monotherapy. J Pediatr. 2013 Apr. 162(4):793-798.e1. [Medline]. Lucas A, Cole TJ. Breast milk and neonatal necrotising enterocolitis. Lancet. 1990 Dec 22-29. 336(8730):1519-23. [Medline]. Eyal F, Sagi E, Arad I, Avital A. Necrotising enterocolitis in the very low birthweight infant: expressed breast milk feeding compared with parenteral feeding. Arch Dis Child. 1982 Apr. 57(4):274-6. [Medline]. Chowning R, Radmacher P, Lewis S, Serke L, Pettit N, Adamkin DH. A retrospective analysis of the effect of human milk on prevention of necrotizing enterocolitis and postnatal growth. J Perinatol. 2015 Dec 3. [Medline]. Berseth CL. Effect of early feeding on maturation of the preterm infant's small intestine. J Pediatr. 1992 Jun. 120(6):947-53. [Medline]. Meetze WH, Valentine C, McGuigan JE, et al. Gastrointestinal priming prior to full enteral nutrition in very low birth weight infants. J Pediatr Gastroenterol Nutr. 1992 Aug. 15(2):163-70. [Medline]. Rayyis SF, Ambalavanan N, Wright L, Carlo WA. Randomized trial of "slow" versus "fast" feed advancements on the incidence of necrotizing enterocolitis in very low birth weight infants. J Pediatr. 1999 Mar. 134(3):293-7. [Medline]. Kennedy KA, Tyson JE, Chamnanvanakij S. Rapid versus slow rate of advancement of feedings for promoting growth and preventing necrotizing enterocolitis in parenterally fed low-birth-weight infants. Cochrane Database Syst Rev. 2000. (2):CD001241. [Medline]. [Guideline] Cincinnati Children's Hospital Medical Center. Evidence-based care guideline for necrotizing enterocolitis (NEC) among very low birth weight infants. Cincinnati (OH): Cincinnati Children's Hospital Medical Center; 2007 Feb.
Young TE, Mangum B. Neofax. Twenty-first edition. Montvale, NJ: Thomson Reuters; 2008. Alfaleh K, Bassler D. Probiotics for prevention of necrotizing enterocolitis in preterm infants. Cochrane Database Syst Rev. 2008 Jan 23. CD005496. [Medline]. Carlson K, Schy RB, Jilling T, Lu J, Caplan MS. The Two Probiotic strains, L acidophilus and S thermophilus, down-regulate Toll-like Receptor 4 Expression in Enterocytes. Presented at PAS Toronto, 2007: Evanston Northwestern Hospital, IL; 2007. Dani C, Biadaioli R, Bertini G, Martelli E, Rubaltelli FF. Probiotics feeding in prevention of urinary tract infection, bacterial sepsis and necrotizing enterocolitis in preterm infants. A prospective double-blind study. Biol Neonate. 2002 Aug. 82(2):103-8. [Medline]. Hammerman C, Bin-Nun A, Kaplan M. Germ warfare: probiotics in defense of the premature gut. Clin Perinatol. 2004 Sep. 31(3):489-500. [Medline]. Millar M, Wilks M, Costeloe K. Probiotics for preterm infants?. Arch Dis Child Fetal Neonatal Ed. 2003 Sep. 88(5):F354-8. [Medline]. Lin HC, Hsu CH, Chen HL, et al. Oral probiotics prevent necrotizing enterocolitis in very low birth weight preterm infants: a multicenter, randomized, controlled trial. Pediatrics. 2008 Oct. 122(4):693-700. [Medline]. Alfaleh K, Anabrees J, Bassler D, Al-Kharfi T. Probiotics for prevention of necrotizing enterocolitis in preterm infants. Cochrane Database Syst Rev. 2011 Mar 16. 3:CD005496. [Medline]. Hand L. NICU: Probiotics Reduce NEC, Should Be Routine, Experts Say. Available at http://www.medscape.com/viewarticle/820814. Accessed: February 24, 2014. Janvier A, Malo J, Barrington KJ. Cohort Study of Probiotics in a North American Neonatal Intensive Care Unit. J Pediatr. 2014 Jan 7. [Medline]. Tarnow-Mordi W, Soll RF. Probiotic Supplementation in Preterm Infants: It Is Time to Change Practice. J Pediatr. 2014 Feb 8. [Medline]. Groer MW, Gregory KE, Louis-Jacques A, Thibeau S, Walker WA. The very low birth weight infant microbiome and childhood health. Birth Defects Res C Embryo Today. 2015 Dec 10. [Medline]. Pneumatosis intestinalis. Photo courtesy of Loren G Yamamoto, MD, MPH, Kapiolani Medical Center for Women & Children, University of Hawaii, with permission. Pneumoperitoneum. Photo courtesy of the Department of Pathology, Cornell University Medical College. Resected portion of necrotic bowel. Photo courtesy of the Department of Pathology, Cornell University Medical College. Micrograph of mucosal section showing transmural necrosis. Photo courtesy of the Department of Pathology, Cornell University Medical College. Histologic section of mucosal wall demonstrating pneumatosis. Photo courtesy of the Department of Pathology, Cornell University Medical College. Histologic section of bowel mucosa showing regeneration of normal cellular architecture. Photo courtesy of the Department of Pathology, Cornell University Medical College. Necrotizing enterocolitis totalis. Pneumatosis intestinalis and multiple areas of perforation were seen. Disclosure: Editorial staff for AAP NeoREVIEWS PLUS (includes reimbursement for meeting expecnses and $300 honorarium; Advisory meetings for the National Certification Corp. development of a QI certification test. (includes all expenses without honorarium) for: American Academy of Pediatrics, National Certification Corp.